Inspired by family, parties and everything Italian Achellos is a great addition to the bustling outskirts of Newcastle Upon Tyne. 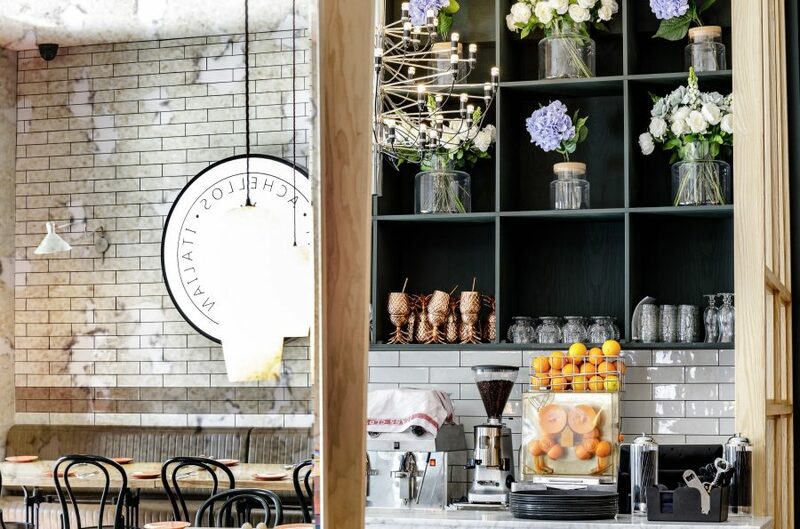 With casual dining at its heart we designed the space to cater for a quick bite to eat on your lunch break or for a large family occasion seating up to forty at one table. Using oversized mirrors we have managed to make every seat a good one, wherever you sit you can view the entire restaurant and be part of the moment. With its high turn around and daily use, durability and aesthetics needed to work hand in hand making it more important to carefully consider every detail and material. The antiqued mirrors, reeded glass, tiled walls, Carrera Marble, and unfinished oak all give Achellos a tactile feel and look that we like to think will only better with use and age. One particular aspect of Achellos that we needed to address was the lack of natural light to the rear of the restaurant. Instead of trying to work against this we thought it best to work with it and create a bright open kitchen pass showing the pizza oven and the theatre of the working space. With light streaming through from the kitchen the effect of a window has been created as you approach the back of the dinning area. With all other aspects of the project being easily explained and agreed the floor proved to be our biggest design choice. The initial option was to go for a light oak to match the walls but after careful consideration and many test samples it was decided that the existing floor which showed the remnants of a old garage and mechanics shop had lots of character and that simply applying a finish to it would only enhance its extraordinary colour. This has proven to be one of the most memorable parts of the project and adds to Achellos unique look. Get in touch and see how we can craft a stunning restaurant space for you.